This Weeks Follow Friday Question:Summer Reading. What was your favorite book that you were REQUIRED to read when you were in school? Hmm... lets see. I would have to say that it was Go Ask Alice By Beatrice Sparks and Anonymous. According to Ponyboy, there are two kinds of people in the world: greasers and socs. A soc (short of "social") has money, can get away with just about anything, and has an attitude longer than a limousine. A greaser, on the other hand, always lives on the outside and needs to watch his back. Ponyboy is a greaser, and he;s always been proud of it, even willing to rumble against the gang of socs for the sake of his fellow greasers -- until one terrible night when his friend Johnny kills a soc. The murder gets under Ponyboy's skin, causing his bifurcated world to crumble and teaching him that pain feels the same whether a soc or a greaser. This classic, written by S.E. Hinton when she was 16 years old, is as profound today as it was when it was first published in 1967. Wow! Great choices. The Outsiders was great, and I still have to read Go Ask Alice. New GFC follower! This is my FF. Follow back, please? Now your school reads sounds loads better than what was required at MY school. So unfair, haha. The Outsiders was one of my picks! I wish we'd have read Go Ask Alice in school! It was a great one too! My TGIF / Follow Friday! You are very welcome and thanks for returning the stop! I've never heard of Go Ask Alice before! It sounds really cool though. Ah you must read it! So good! The Outsiders is also on my list! 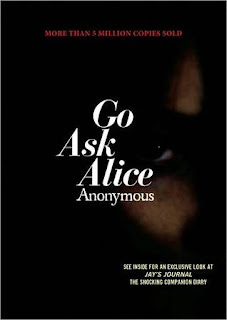 I really want to read Go Ask Alice. Old Follower! Nice! Don't think I had to read that one. 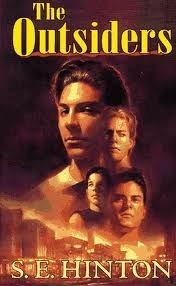 I remember the Outsiders from grade school or middle school. Cannot recall which! I've not heard of Go Ask Alice, but I loved the Outsiders (and the movie was filmed in my hometown and high school. I'm having my blog launch and Giveaway! Can't believe I have never read either one of these books!!! Yikes!! Yea, I am sure there were others I loved, but these two are the only memorable ones. Thanks for stopping by! That is so awesome! Thank you for the follow!! Thanks for the follow!! And you must read Go Ask Alice!